Controlled appellation This village, the largest of the Côte Chalonnaise, is also the most famous wine of this coast. 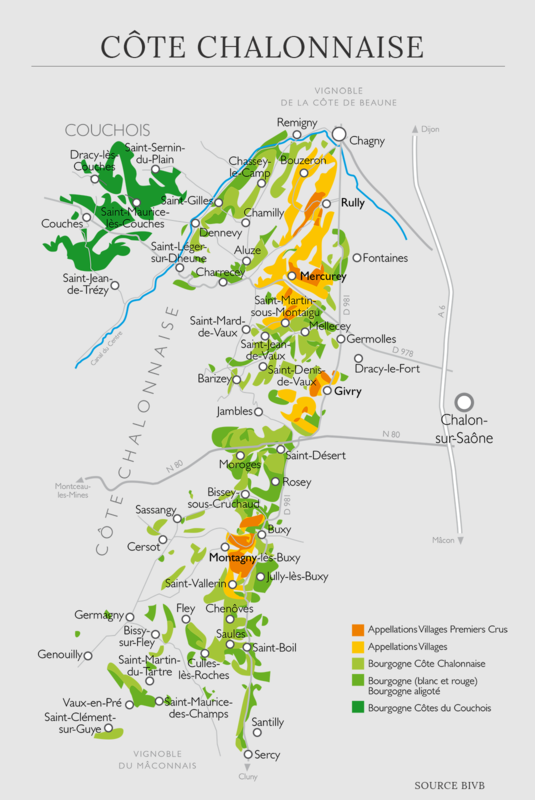 It is located at 12 kilometres from the south of the Côte de Beaune. Village in relief with various exposures, it extends on two villages; Mercurey and Saint-Martin-sous-Montaigu; hamlet also has climates classified 1er Crus (white and red). Local soil Clay-limestone throughout the appellation. Wine-making Manual harvest picking together with a hand selection of each grape. De stemming and an alcoholic fermentation in open vats during 18 days before a pneumatic pressing. Daily punching of the cap. Maturation in oak barrels, with 20% of new oak barrels, balance is in barrels of 1 and 2 years old. Character and style Bright vermilion colour with dark reflexion. Fresh and delicate nose opens with some notes of ripe fruits (crushed strawberry, violet). The palate is fine and attractive. It confirms the red and black fruit (blackberry, morello cherry). It is gently supported by some fine and silky tannins. Behind these sensations of ripe fruit accompanied by few wild nuances, the wine is persistent on the palate. It is frank and straightforward and reveals both refinement and elegance. This is a wine, young, that can be enjoyed slightly fresh. Then it will be ideal for the grill of all the meat (especially white) and the pork. It will not be shocking or cooked together with a tasty fish. After three or four years; roasted meats, cooked meat on various sauces (blanquettes, wine or mustard) will be highly appreciated. Finally a wide choice for this wine of terroir and character.